All organizations need resources of manpower, money, material and machinery to function effectively. The resources by themselves cannot fulfill the objectives of the organization, they need to be collected, coordinated and utilized through human resources who in turn are to be managed effectively and efficiently. Hence human resource management (HRM) is a major activity in an organization that deals with issues related to people. It is the process of recruitment, selection of employee, providing orientation, induction, and training as well as the development of skills, performance appraisal of employees, providing proper compensation and benefits, motivating, communication, administration, maintaining proper relations with employees as well as with trade unions, maintaining employee’s safety, welfare and health by complying with labour laws and organization development. HRM is a multidisciplinary subject. It involves management functions like planning, organizing, directing and controlling. It includes the study of management, psychology, communication, economics and sociology. It involves team spirit and team work. It is a continuous process. The core purpose of the human resource management is to make efficient use of existing human resource in the organization. The ten ‘Cs’ of HRM are (i) cost effectiveness, (ii) competitive, (iii) coherence, (iv) credibility, (v) communication, (vi) creativity, (vii) competitive advantage, (viii) competence, (ix) change, and (x) commitment. Edwin Flippo has defined HRM as ‘planning, organizing, directing, controlling of procurement, development, compensation, integration , maintenance and separation of human resources to the end that individual, organizational and social objectives are achieved’. The National Institute of Personal Management (NIPM) has defined HRM as ‘that part of management which is concerned with people at work and with their relationship within an enterprise. Its aim is to bring together and develop into an effective organization of the men and women who make up enterprise and having regard for the well – being of the individuals and of working groups, to enable them to make their best contribution to its success’. As per Decenzo and Robbins ‘HRM is concerned with the people dimension in management. Since every organization is made up of people, acquiring their services, developing their skills, motivating them to higher levels of performance and ensuring that they continue to maintain their commitment to the organization is essential to achieve organizational objectives. This is true, regardless of the type of organization – government, business, education, health or social action’. HRM is a strategic and comprehensive approach to managing people and the workplace culture and environment. Effective HRM enables employees to contribute effectively and productively to the overall direction and the accomplishment of the organization’s goals and objectives. HRM is moving away from traditional personnel, administration, and transactional roles. HRM is now expected to add value to the strategic utilization of employees and that employee programs impact the business in measurable ways. The new role of HRM involves strategic direction and HRM metrics and measurements to demonstrate value. The scope of human resource management refers to all the functions that come under its banner. 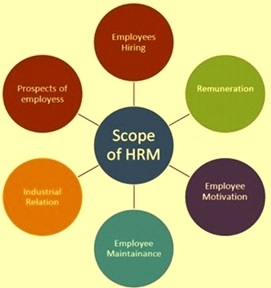 The scope of major functions of HRM is shown in Fig 1. Various functions of HRM are described below. Human resource policies and procedures – Formulation of human resource policies and procedures is a very important function of HRM. These policies are necessary so that the employees get fair treatment. Normally these policies and procedures are published in a consolidated form as HRM manual. Communication – HRM facilitates communication between management and the employees. It ensures that the communication lines are always opened so that employees remain motivated all the times to give their best. It also facilitates external communication so that the organization has a positive image with its stake holders. Human resource planning – Under this function, the number and type of employees needed to accomplish organizational goals are determined. Research is an important part of this function because planning requires the collection and analysis of information in order to forecast availability of human resources and to predict the future requirement. The basic human resource planning strategy includes staffing and employee development. Job analysis – It is the process of describing the nature of a job (qualification, skills and experience etc.) and specifying the human requirements to perform it. The product of the process of job analysis process is the job description which spells out work duties and activities of the employees. Job descriptions are vital source of information because job content has a great influence on human resource programmes and practices. Staffing – It includes the selection and the recruitment of the human resources for the organization. Human resource planning precedes the actual selection of people for positions in the organization. As per this function HRM ensures the selection and recruitment of those persons who meets the requirements of the job as well as the organization as determined by the job description. Orientation – It is the first step towards helping a new employee to adjust himself to the new job as well as to the organization. It is a method to acquaint a new employee with particular aspects of his new job, including pay and other benefits, working hours, and the rules and expectations of the organization from him. Training and development – The function of training and development is to provide the employees skills and knowledge to perform the jobs effectively. Under this function training programmes are also organized for experienced employees whose jobs are undergoing change. Management development programmes are also arranged for preparing employees for higher level responsibilities within the organization. Performance appraisal – Under this function employee performance is monitored to ensure that it is at acceptable levels. Human resource professionals are usually responsible for developing and administering performance appraisal systems, although the actual appraisal of employee performance is the responsibility of supervisors and managers. Besides providing a basis for pay, promotion, and disciplinary action, performance appraisal information is essential for employee development. Career planning – It is the activity of HRM which includes assessing an individual employee’s potential for growth and advancement in the organization and planning for the same. Compensation – Human resource personnel provide a rational method for determining how much employees should be paid for performing certain jobs. Since compensation is a major cost to the organization, it is a major consideration in human resource planning. Compensation affects the staffing as well as it is an important incentive in motivating employees to higher levels of job performance and to higher paying jobs within the organization. Benefits – These are another form of compensation to employees other than direct pay for work performed. As HRM function, employee benefits shares many characteristics of the compensation function. Benefits include items which are provided as per the statutory provisions as well as those items which are offered at the discretion of the management. Motivation, welfare, health and safety – These are the important activities of HRM. These activities are important so that the employees not only remain with the organization but also give their best output to the organization. HRM assists employees in achieving their personal goals, at least insofar as these goals enhance the individual’s contribution to the organization. Personal objectives of employees must be met if they are to be maintained, retained and motivated. Otherwise, employee performance and satisfaction may decline, and employees may leave the organization. Industrial relations – It is the interaction with employees union. Under this function the responsibility of HRM primarily involves keeping a cordial relationship with the employee’s unions and negotiating with the unions regarding wages, service conditions, and resolving disputes and grievances well in time to prevent industrial disturbances and strikes. Record keeping – Maintenance of the record of employees is the basic function of HRM. This function involves recording, maintaining, and retrieving employee related information for a variety of purposes. Records which must be maintained include application forms, qualification and training records, performance appraisal records, health and medical records, employment history (jobs held, promotions, and transfers etc. ), seniority lists, earnings and hours of work, leave records, rewards and achievements and other employee data. Complete and up-to-date employee records are essential for efficient HRM. Grievance handling and redressal – Grievance procedures and redressal is an important function of HRM for improving the employee’s morale. Employee satisfaction survey – . Through a well-designed attitude survey, employee opinions is gathered on wages, promotions, welfare services, working conditions, job security, leadership, industrial relations, and similar aspects. These surveys provide useful input to the management for decision making. Managing change – HRM has to play an important role in managing the change which an organization has to undergo because of the changing external environment. HR personnel are to act as change agent and to facilitate the change so that it takes place smoothly. Organization development – HRM plays a major role in the development of organizational culture and the business strategies. HRM relates people and work so that the organizational objectives are achieved effectively and efficiently. HRM achieves the improvement in the organizational performance through improvement in the employee’s performance. Societal objective – HRM is to ensure that the organization is socially responsible to the needs and challenges of the society while minimizing the negative impact of such demands upon the organization. It also ensures that the organization complies with the laws and regulations of the land and meets the statutory requirements. Though I studied HRM in my MBA,it refreshed me better.